Grapefruit is so refreshing in the summer and this is the perfect dessert! Citrus zest can guard against skin cancer so while you’re cooling yourself with this chilly treat you can also be protecting that gorgeous tanned skin! 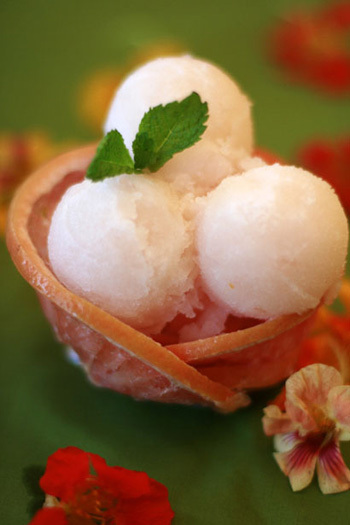 Great for summer parties, the sorbet can be prepared three days in advance. Find out about the health benefits of grapefruit. If you’re taking prescription medication check with your doctor before enjoying grapefruit. In a medium saucepan, mix sugar and water. Bring the mixture to a boil and reduce heat to low. Simmer 4 to 5 minutes until the sugar is completely dissolved. Remove from heat and stir in the grapefruit juice, vodka, zest, and cinnamon. Ice Cream Maker Method: Transfer mixture to ice cream maker, process according to manufacturer’s instructions. Freezer Method: Pour into container, cover, and place mixture in freezer. When it is semi-solid, (about 1 -1 1/2 hours), mash it up with a fork and refreeze again. When frozen, place in a food processor or blender and process until smooth. Cover and refreeze until serving time. Nutritional Stats Per Serving (1/2 cup): 60 calories, 0 g protein, 11 g carbohydrates, 0 g fat (0 g saturated), 0 mg cholesterol, 0 g fiber, 1 mg sodium.